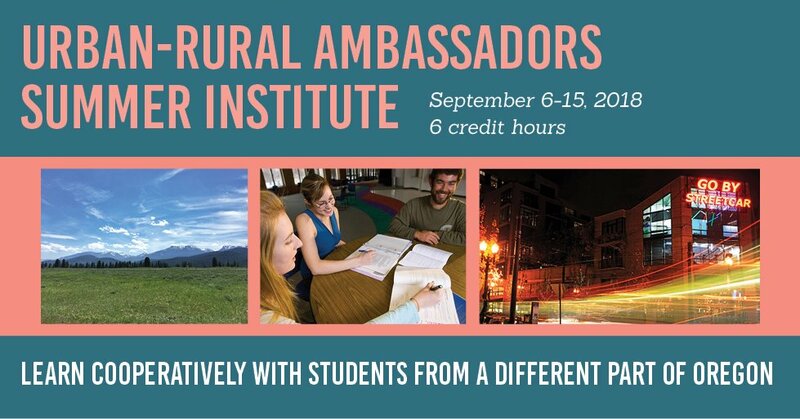 Eastern Oregon University (EOU) and Portland State University (PSU) are leading an effort, along with their community partners, to create an Urban-Rural Ambassadors Summer Institute, a two-week, six-credit residential summer institute for undergraduate students to explore urban and rural connections in Oregon, and to develop the collaborative skills to work across Oregon’s urban-rural divide. To register, students should contact their academic advisor or Geography faculty member Maren Peterson. To support this program, make a contribution via the EOU Foundation. Students will spend a week in La Grande studying rural issues and a week in Portland studying urban issues. The institute will include field trips highlighting local issues and culture, dinners with informational speakers, and structured opportunities to speak with community members. Class work will culminate in teamwork between urban and rural students who will synthesize what they’ve learned in a project that demonstrates their capacity to serve as urban-rural ambassadors who advance collaboration on regional solutions in their professional and civic lives. The institute will allow tomorrow’s leaders to learn from each other about regional commonalities and differences. Students will develop the capacity to forge a path through the tension and stalemate that often characterize urban-rural debate and to find solutions that fit local economies, values, and ways of life for the advancement of Oregon as a whole. In April of 2018, Governor Brown visited Eastern Oregon University to sign a bill allocating $9 million toward building a field house on their campus. At the media event, she took the opportunity to announce Portland State’s collaboration with Eastern Oregon University on the Urban-Rural Ambassadors Summer Institute.